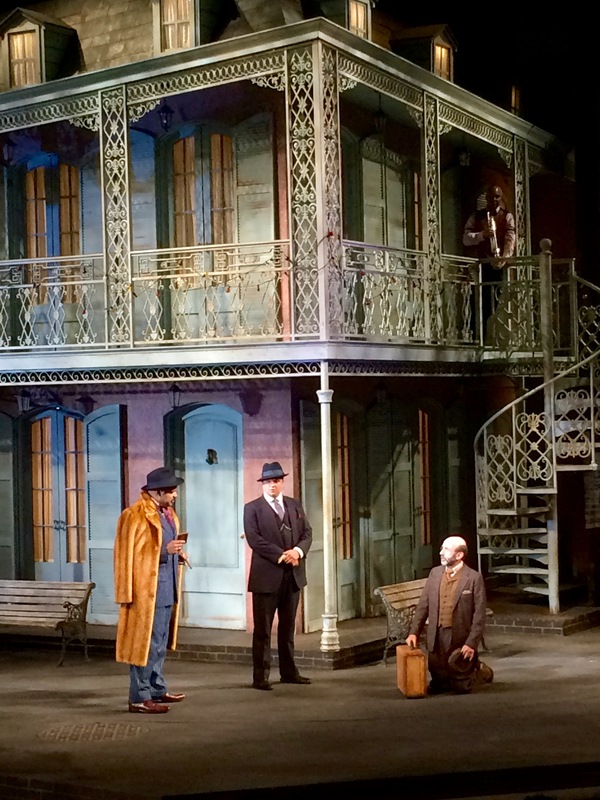 Magnificent sets from Shakespeare’s “The Comedy of Errors” at San Diego’s Old Globe Theater. (Set Designer Alexander Dodge). Hopefully it is all right to display this photo that I snapped last night??? Usually, I prefer to see a theatrical production in it’s original format- musicals with all the songs, operas with full sets, not minimalistic productions, Shakespeare in all it’s Elizabethan splendor. The Old Globe Theater of San Diego presented a superb rendition of Shakespeare’s “The Comedy of Errors” that I swear should not be missed! Director Scott Ellis‘s 1920’s New Orleans setting for this play was MAGNIFICENT. I would like to know if this was his recreation or a previously produced version- I gather from our “Performances” magazine/playbill that this is, in fact, his baby. In January, he was described as “the busiest director on Broadway,” with three shows running simultaneously. This same Daily News article mentions his San Diego production, and I am beginning to get the idea that we are really lucky to have this director and his take on “The Comedy of Errors” here in San Diego. On leaving the theater, I enjoyed forcing my opinions on the crew of teens that we brought with us last night. They had to listen to me, I was their ride home, HA!! I think that all the Shakespeare that they study should be viewed first, and then read. They need to see this language alive, intact, and played back-and-forth between actors, not the dry, difficult context of the he-said, she-said, dialog on a dull page. Our Exchange Student (we’ve exchanged The Girl, who’s off to college, for her friend) will be reading “Hamlet” for his AP senior English class. I told him I’m going to find the best production of Hamlet that I can locate via Netflix, Amazon Prime, or any other streaming services and make him watch it. Personally, I find it easier to understand Shakespeare when I watch a play. Afterward, his written words make more sense!